Dr. Vanessa and her husband, Dr. Mark, were high school sweethearts. They both attended LSU for their undergraduate work – and although she had always planned to become a chiropractor, he had originally planned to be an engineer. At some point, chiropractic rubbed off on Dr. Mark and he decided to also pursue chiropractic. They later attended Texas Chiropractic College and she remembers going through that experience together as a very special time in her life. Dr. Vanessa wants so badly to be a part of that miraculous change so many patients experience, that she says one of her biggest personal challenges is managing her time with patients. She often finds herself wanting to fix every part of each patient, and she is willing to invest a lot of time to do so. “I like to cook and bake a lot,” says Dr. Vanessa. “When I get together with friends and family, that’s my favorite thing to do.” Dr. Vanessa places a high value on family, motherhood, and spending ample time doing things with her children. 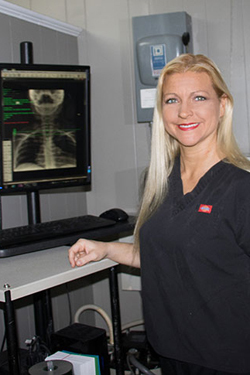 She loves the flexibility of her career as a chiropractor and that it allows her to be a mom who is involved. One of her passions is caring for pregnant women, children, and babies. Check out our Pediatric Care page for more information about the type of care she provides for pregnant women and children. Call (225) 927-8160 for an appointment with Dr. Vanessa today.